Be gone, stain! Don’t you wish you had a magic wand to wave over stubborn stains? Our stain removal guide will help you remove even the most stubborn stains – regardless of the location, fabric and type of stain. Cotton – Cotton can endure hot water, cold water, repeated washing and scrubbings. If the stain is on cotton, you have the most removal options. Wool – More delicate than cotton, wool cannot endure repeated washing and should be spread flat to dry. Synthetic – Stains on synthetic fabrics can be tricky, especially paint stains. Some solvents like acetone or ammonia can melt or degrade the fabric. Be careful! Silk – A very delicate fabric, silk can be ruined if the stain removal efforts are too hostile. It may be best to take stained silk to a professional dry cleaner. Water – Hot, cold, free, fresh and plentiful. Water will be your first line of defense. Rinse, blot, dab and repeat; water by itself can’t do much damage. Vinegar – Vinegar is a natural and effective stain remover. When using it on wool or synthetics, use sparingly, and consider spot-testing in an inconspicuous area first. Hydrogen Peroxide – Great for removing blood or rust stains, hydrogen peroxide has a bleach effect without the destructive color change. It is color safe and also disinfects. Detergent / Stain Remover – Use these to scrub out stains before you launder clothes normally. Stain removers have special enzymes to help release stubborn stains. Rubbing Alcohol – Effective for removing inks, dyes and chemical-based stains. Ammonia – A common and useful household cleaning chemical. Dilute it in a spray bottle. Never mix ammonia with bleach. Dish Soap – A mild and versatile solvent. Mixed with water, dish soap is effective on grease, condiments and just about anything. Mineral Spirits / Acetone – These are necessary to remove paint stains but can be harsh on synthetics. Bleach – Effective yet harsh, bleach is usually a last-resort option for removing stains from whites. 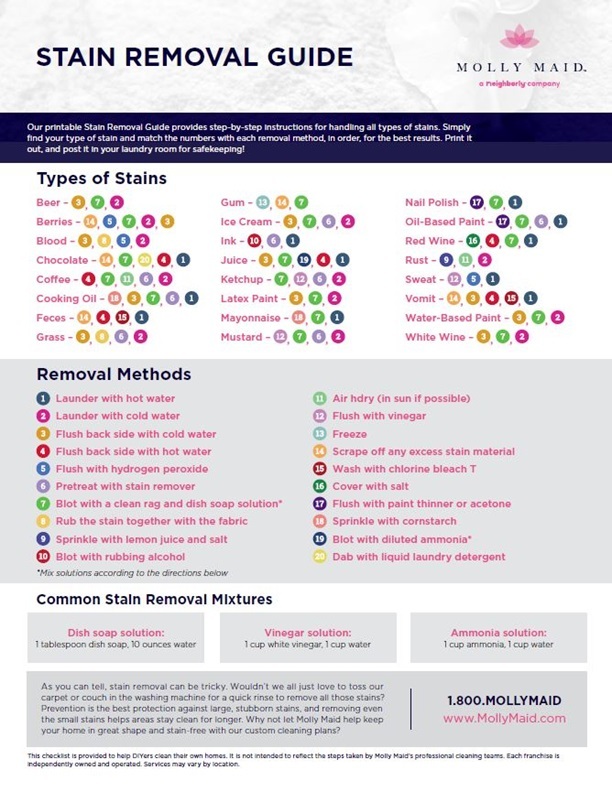 Our Printable Stain Removal Guide provides step-by-step instructions for handling all types of stains. Simply find your type of stain and match the numbers with each tactic for the best results. Print it out and post it in your laundry room for safe keeping! Air dry first. Before drying the garment in a dryer, make sure the stain is removed. Otherwise, the heat could set the stain. Can’t bring your car to the sink to remove the vomit? A wet/dry vacuum is very handy for stains that can’t be laundered, brought to the sink or easily reached. Just use the suction to remove water and cleaning solutions along with the stain. Treat all stains as quickly as possible. Always spot-test solvents on clothing before proceeding. Test if a garment is colorfast: Pour a small amount of hot vinegar in a small area, and let it rest for three minutes. Blot it with a paper towel. If color comes off, the garment is not colorfast, and color could bleed. Some stains remove best when cold. Stick the garment in the freezer, put an ice cube on top of the stain or spray it with a can of compressed air upside down. If the stain persists, repeat steps as necessary. As you can tell, stain removal can be tricky. Wouldn’t we all just love to toss our carpet or couch in the washing machine for a quick rinse to remove all those stains? Prevention is the best protection against large, stubborn stains, and removing even the small stains helps areas stay clean for longer. Why not let Molly Maid help keep your home in great shape and stain-free with our custom cleaning plans? Call (800) 654-9647 to connect with your local Molly Maid today.